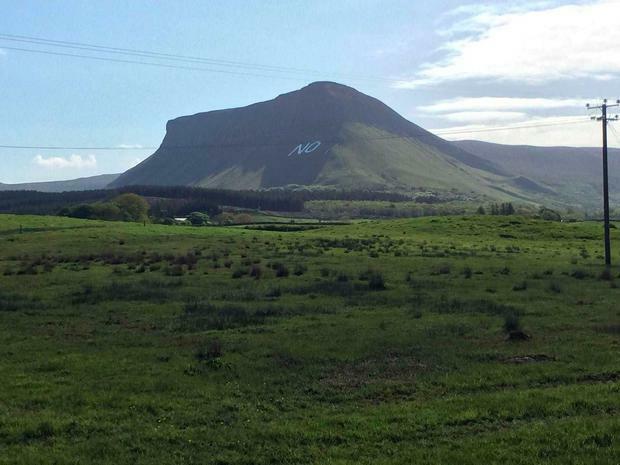 A team of 20 Pro-life campaigners in Sligo have constructed a giant 'No' slogan on Ben Bulben mountain this morning because their argument is "not being heard". Meanwhile, a priest from a nearby local parish described the placing of the sign as a "bridge too far". 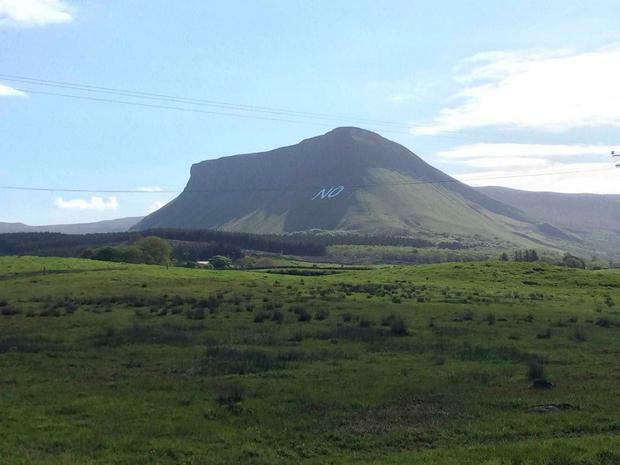 The sign which is clearly visible around the area of Grange has met with negative reaction on both sides of the campaign within the North Sligo community. Fr Christy McHugh said; "There is no need for it... The last time that was used was for H Block. In the times that were in it, it was trying to make a point that hadn’t been listened to. This referendum has been listened to very well." With the Catholic Church advocating a 'No' vote, Fr Christy said that this slogan has only damaged the campaign. "We don’t need this kind of thing to make a point," he said. Sligo County Council issued a statement saying that they have received a "number of complaints" in relation to the sign. "The Council considers that any issues arising from the erecting of this signage can only be dealt with under Planning legislation. The matter therefore is now subject to investigation by the Planning Enforcement Section. "As with all complaints received, these will be investigated by enforcement staff in accordance with the provisions of planning legislation," the statement read. Sligo County Councillor and Grange native Cllr Marie Casserly said the sign has only proved to get people’s backs up. "It certainly has annoyed people on both sides and I have gotten calls from both sides. It’s not good for the campaign and it’s not good for the area," she said. "People are able to make up their own minds without posters and without that. They should be allowed to make up their own minds. The side of a mountain, whatever your beliefs, is not the place to put up a sign like that," said the Independent Councillor. "Let people make up their own minds in an educated way. People are intelligent and they should be allowed based on fact to make up their own minds," she added. Local publican and B&B owner Edward Moran believes the sign will only have a negative effect on local tourism. "I had four guests this morning who told me about it. Even they didn’t agree with it. From a tourist point of view it’s totally wrong. If it was ‘YES’ it would be wrong as well. "We’re making our biggest tourist attraction into a political billboard. We all know we have to vote," said the Morans Bar B&B owner. 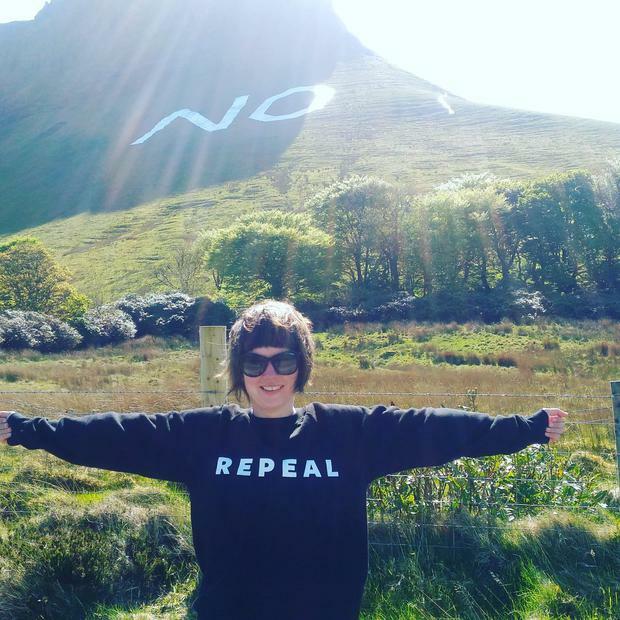 But, speaking to Ocean FM’s Niall Delaney this morning, Tommy Banks of Sligo for Life said: "It’s a cry from the mountains to save Ireland’s babies because no one is listening." Mr Banks, one of 20 who had been up since 4am to construct the sign, said it was "horrific to think that we have to do this." Mr Delaney interjected to say; "You don’t have to do this. 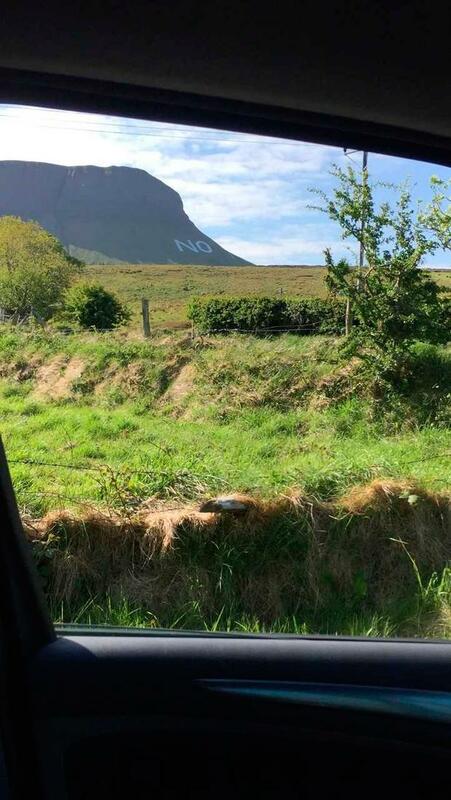 People are outraged, on both sides, be it Yes or No, that anybody could see fit to deface an iconic mountain like Ben Bulben." Mr Banks said the gardai were notified and would not be removing the sign because the campaigners were given permission by the landowners to construct the message: "We had a nice visit here from a nice Sergeant and he was very courteous, he was very happy with what’s going on, he came out to see." "I hope the government sees this and Varadkar sees this because they are not heeding the people," Mr Banks continued. Christopher, one of the men who helped cut the plastic sheets to construct the sign said he was "disillusioned with the lack of ability to get one side of an argument out in Ireland" and called the action a "cry for help". "No posters have been cut down all across the country. Facebook shut down the argument. Google have shut down the argument, so I mean is it any wonder men are driven to climb a mountain and put up a massive ‘N’ ‘O’?"